Wow, this trip recap seems to be taking a year. I’ve been in the weeds with finishing up my MFA lately–this past Friday the first draft of my thesis was due, tonight I had an exam in my class on Chaucer, Friday is my Comprehensive Exam, then there’s a 20 page paper due for Chaucer, oh, and that thesis has to be finished in two weeks too. Never enough hours in the day. Thankfully my exam only took an hour tonight, so I have a few spare minutes post-fixing up my bike and cleaning the house a bit. I will be oh-so-thankful when I graduate and have some time to myself. Time for cooking, maybe? Such an exciting thought! 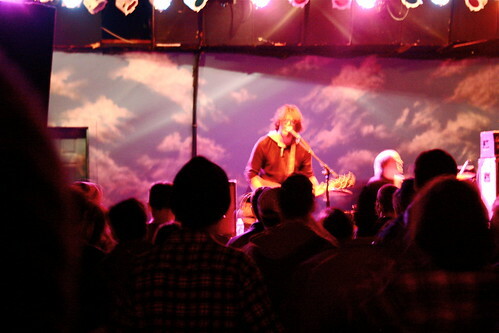 So the reason G & I initially drove down to Chapel Hill was to see Sebadoh play at the Cat’s Cradle on Sunday, March 27. Before the show, though, I was lucky enough to meet up with an old friend! 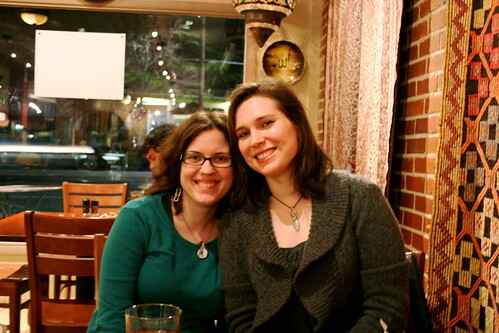 A & I lived in the same Freshman dorm at Emory and got into some awesome hijinks together–including cramming into my tiny car with four three other people to drive six hours south to the beach one weekend for a one night beach camping trip. I’m not sure we slept at all that weekend, but it was so worth it. She now lives in Chapel Hill with her lovely partner who survived the Appalachian Trail with her, and even though she’s only two hours south, this was the first time I’d seen her in over a year. 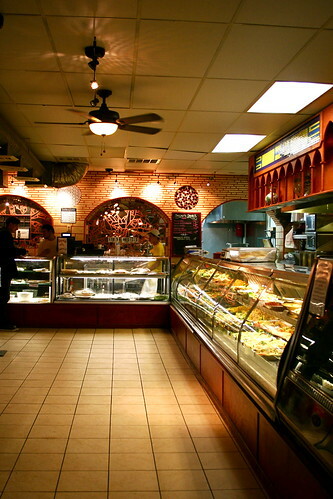 A. took us to Mediterranean Deli, a Greek/Mediterranean restaurant of amazingness. It can easily seat 150 people and beyond the menu to order from, there are four or five cases filled with authentic Mediterranean dishes–from your usual hummus and baklava to stuffed cabbages and muhammera, a pomegranate and walnut dip. The nifty thing is that you can order a 2-4 item sampler and choose anything you want from the cases. G & split some muhammera (I’m a believer–that stuff is so savory good! ), a stuffed cabbage, spanakopita, and lamb sfeha. As good as the sampler was, the highlight for me was the falafel. I’m a sucker. Falafel just falls into that category of “I can’t find it in Roanoke.” It’s not that I can’t exactly find falafel here–it’s that it’s either not good or too expensive and fancy to be what I crave. Mediterranean Deli’s falafel isn’t what I crave (that award goes to Falafel King in Atlanta), but it’s close to hitting the spot. Plus it’s only $5.95 for a giant double portion. Fried and crunchy with tomatoes, lettuce, in-house pita (ask for whole wheat, they have it), you can add extra tahini, tzatziki, peppers, etc. I couldn’t have been happier with the sandwich. Or the company (smile). Post-eating, G & I rushed to Cat’s Cradle and caught the show–surprisingly not sold out, but maybe that’s because UNC seemed to be on spring break or maybe because Sebadoh’s following is…er…too old? I mean that in the best possible way, but it does seem like everyone in their 30s and early 40s has a kid or two keeping them from going to shows, having a good time. But the crowd that did show up was great and at least it was extremely easy to get a good spot. Lou Barlow and the rest put on an amazing show (pretty much played the entire Bakesale album–my favorite–with other album hits mixed in) and while I was never lucky enough to see them the first time around, seeing them late in their career (did they ever technically call it quits) was an incredible experience. I’ve now seen Pavement, Sebadoh, and I’m going to see Guided by Voices in June–I’m one lucky girl! I may have been born in the wrong generation for my music tastes, but at least now I’m getting to catch up a bit. All in all, Chapel Hill is an amazing place & I have fallen madly in love. From good coffee to food trucks to James Beard nominated chefs, the town has it all. Plus it’s the Piedmont. What’s not to love about the Piedmont? Thats awesome that you got to see and old friend and cool band! I’d love to catch up with my old roommates. Hang in there with the MFA; lots of radio silence going on at our blog for the selfsame reason — suddenly EVERYTHING is due, and I have an editorial letter and am revising a manuscript so our house looks like the scene of a crime, and we’re down to having toast and tea for meals. Ack, good luck to you guys too!!! 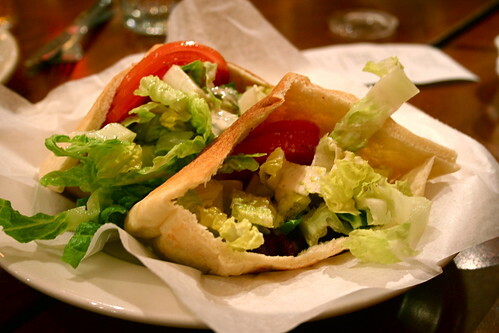 I love falafel too, especially when it is with really really good pita and hummus. Mmm. I can’t believe you are keeping up with blogging while working on thesis, Amazing! Good Luck! Yay, home stretch! You can do it! Go MFA!